Ligustrum Ovalifolium is a popular versatile semi evergreen widely used for hedging. It is fast growing creating a lovely dense hedge with medium sized dark green leaves. Green Privet hedging plants (Ligustrum ovalifolium), one of our most popular and familiar hedging plants in the UK, the oval shaped leaves are paler green when young, becoming much darker as they mature. Fragrant clusters of white flowers (very popular with butterflies) are produced during the summer months, especially on plants that have not been trimmed. Green Privet is a semi evergreen hedging shrub, in the shelter of suburban town gardens Privet hedges will usually remain evergreen all year although in colder and more exposed situations the plants may drop their leaves, especially during cold snaps but this is perfectly normal, and they will re leaf fairly early the next season. Privet is such a popular hedging because it is virtually indestructible and perfectly suited to the UK climate, here we have a hedge that grows in any situation from full shade to full sun and in any soil type from thin and sandy to heavy clay and including chalk. (Waterlogged soil is the only situation this versatile plant won’t grow in). Green Privet hedges can be kept in good order with a single trim at any time of year, twice a year if you want a more manicured and formal look. Green Privet hedging plants can be used to create hedge of all sizes from 90cm up to around three metres and with a reasonably fast growth rate of at least 30cm a year in decent soil, even plants of more modest sizes will give coverage within a few seasons. Bare root Privet are grown in the soil in our fields and lifted for sale when dormant from November until April which is the correct time for planting. We don’t need compost or pots to produce the crop and far less fertiliser and water. With such a lean production system these bare root hedging plants are unbeatable value and by far the most economical way to establish a new Green Privet hedge. Bare root Privet plants will almost always shed all their leaves after planting (you may even find many of them in the bottom of the carton when they are delivered!). Don’t let this put you off, it is perfectly normal, and they will re leaf the following spring. Pot grown Privet plants are available for planting all year round, because there is no root disturbance these plants will establish and grow away readily regardless of the time of year that you choose to plant. We have pot grown Green Privet plants in a wide range of sizes together with many other hedging species, all grown here on our own nursery. Our root ball Green Privet hedging plants are grown at extra wide spacings in our own fields here in Kent, regularly trimmed to grow dense and bushy for real impact right from the moment they are planted. They are lifted with our specialist machine with the soil and immediate root system which is wrapped in hessian mesh for protection and should be left on when planting, it is biodegradable and will disappear quickly. Rootball plants are a great choice if you want maximum impact at fairly modest cost. Root ball Green Privet hedging plants are delivered to you by pallet courier (they are far too tall and heavy for parcels! ), delivery is free on orders over £200 (ex VAT) and we have generous quantity discounts if you require a large number of plants for your hedging project. 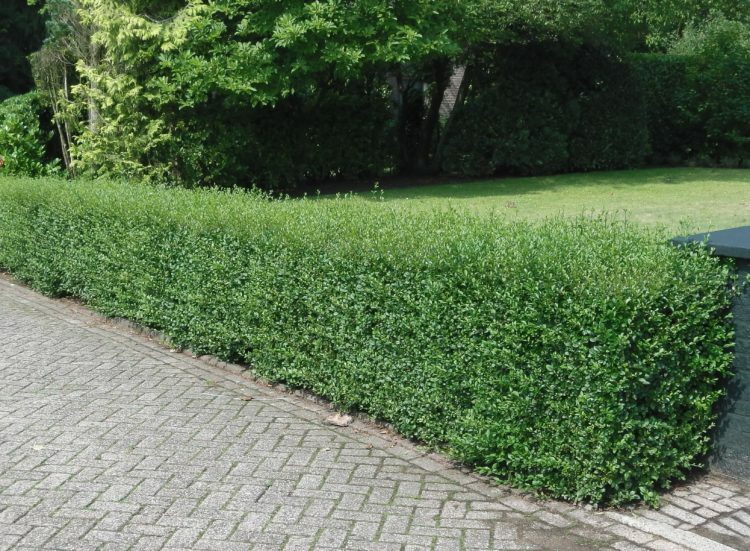 Green Privet instant hedges are the perfect solution where immediate coverage or landscape impact is required. Our smaller, younger trough hedges have been trimmed at the sides, they are easy to handle, quick to plant and are great value for money. The larger and taller troughs have been trimmed on the top and the sides and will bring a greater degree of coverage from the moment they are planted. Hedge elements are the tallest option with sizes up to 200cm, the best option where maximum effect is the top priority. (You may also like to consider the larger sizes of pot grown and root ball Green Privet hedging plants which will also give good coverage when planted at closer spacings if your budget won’t stretch to the instant hedging options.) We also stock instant hedges in a wide range of alernative species that you may like to consider. Planting distance is very much a matter of personal choice, and how patient you are prepared to be. We have our recommended planting density next to each size as a guide. You can use our handy calculator to work out how many you need if you know the meterage to be planted, tick the box if you want a double row hedge. (This increases the number of plants by 50% to give a much thicker hedging result more quickly) Alternatively we have added a small chart below, three plants per metre is adequate (especially for larger sizes of potted and rootball plants), five per metre planted in a double row will give faster coverage or you could use 7 per metre with smaller sizes (under 100cm in height) to give a really quick developing hedge. For our Instant Privet hedges you will always need 1 unit per metre of hedge, set at 100cm centres. Delivery is free on orders over £50 (ex VAT), for larger quantities of Green Privet hedging plants we offer generous quantity discounts. We also stock the colourful Golden Privet and Wild Privet which you might like to consider as alternatives, both may be found on our main Privet page. We have both in a range of sizes. We send detailed yet easy to follow planting instructions by email when you place an order, and we pop a printed copy in with the plants so you have it handy. We strongly recommend you use Rootgrow when planting as this native mycorhizal fungi greatly speeds up establishment and growth of new hedges. For any questions about Green Privet or any other hedging plants please do give our sales team a call on 01580 765600, they will be pleased to help.